As poaching rates have spiked in recent years, humans have emerged as African elephants' biggest threats -- a fact that clearly isn't lost on them. According to a new study, elephants have actually developed a unique word-like sound specifically to warn one another about the danger posed by people. Researchers from Oxford University conducted audio experiments involving elephant herds in Kenya. When the sound of human voices, recorded from local tribespeople, was played to a group of wild elephants at rest, the animals reacted immediately, becoming vigilant and running away whilst producing a distinct, low rumbling sound with their throats. Scientists then played back this sound to another herd of elephants, and the reaction was the same -- indicating that the rumble serves as an alarm call alerting others that danger is near. Remarkably, this rumble appears to contain not only a call to flee, but information on the type of threat as well. Elephants presented with another threatening sound, that of swarming bees, produced an entirely different low rumble and escape reaction. When this alarm call was played back to another group of elephants, they reacted by flapping their ears and running away just as if bees were actually present as suggested by the recorded rumble. "Our research results here show that African elephant alarm calls can differentiate between two types of threat and reflect the level of urgency of that threat," says researcher Lucy King. "Interestingly, the acoustic analysis showed that the difference between the 'bee alarm rumble' and the 'human alarm rumble' is the same as a vowel-change in human language, which can change the meaning of words. Elephants use similar vowel-like changes in their rumbles to differentiate the type of threat they experience, and so give specific warnings to other elephants who can decipher the sounds." Sadly, humans have given elephants just cause to be concerned. 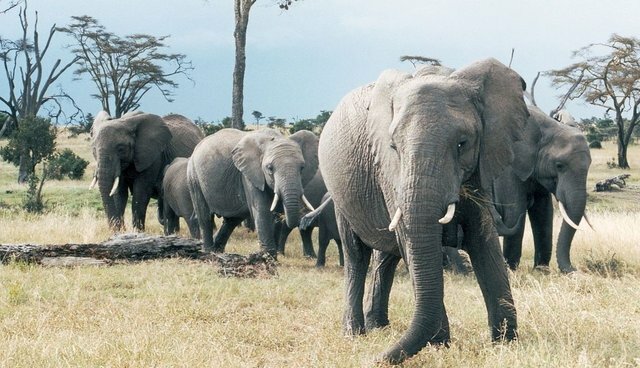 Tens of thousands of elephants are killed every year throughout Africa at a rate of roughly one every fifteen minutes.